The design originated in 1935 from a requirement by United Air Lines. The goal was to develop a much larger and more sophisticated replacement for the DC-3 before the first DC-3 had even flown. There was enough interest from other airlines that American Airlines, Eastern Air Lines, Pan American Airways and Transcontinental and Western Air (TWA) joined United, providing $100,000 each toward the cost of developing the new aircraft. 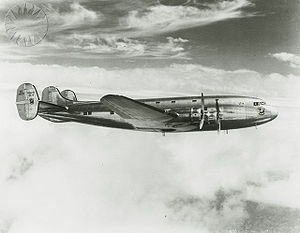 As cost and complexity rose, Pan American and TWA later withdrew their funds in favor of the Boeing 307 which was anticipated to be less costly. With a planned day capacity of 42 passengers (13 rows of two or more seats and a central aisle) or 30 as a sleeper transport (like the DST), the DC-4 (as it was then known) would seat twice as many people as the DC-3 and would be the first large airplane with a nosewheel. Other innovations included auxiliary power units, power-boosted flight controls, alternating current electrical system and air conditioning. Cabin pressurization was also planned for production aircraft. The novel tail with three low vertical stabilizers enabled use of existing hangars and provided sufficient vertical fin area to allow the aircraft to take off with only two engines on one side operating. The wing planform was similar to the DC-3, with a swept leading edge and almost straight trailing edge. The four 1,450 hp (1,080 kW) Pratt & Whitney Twin Hornet 14-cylinder radials were all mounted with noticeable toe-out, particularly the outer pair. The prototype (NX18100, s/n 1601) first flew, without incident, on June 7, 1938 from Clover Field in Santa Monica, California in the hands of Carl Cover. Teething trouble however, delayed the Approved Type Certificate until May 5, 1939. It was used by United Air Lines for in-service evaluation during 1939. Although the aircraft was relatively trouble-free, the complex systems proved to be expensive to maintain and performance was below expectations, especially with an increase in seating to 52 and gross weight to 65,000 lb (29,484 kg). The design was abandoned in favor of a smaller, less-complex four-engined design. This newer design was designated DC-4, leading to the earlier design to be re-designated DC-4E (E for "experimental"). Sold to Imperial Japanese Airways, which was buying American aircraft for evaluation and technology transfer during this period, DC-4E was reverse-engineered and became the basis for the unsuccessful Nakajima G5N bomber.